Planet X, in the vicinity of the Jungle Oasis, is experiencing some weather. So while we’re waiting for that to clear up, I’m going to be taking a few weeks to catch up on some other projects that need some doing. One of those projects is a four-page story for Tom Dell’Aringa’s amazing comic, Marooned. Tom’s in the final stretch of his epic story and will soon be starting a Kickstarter campaign for an all inclusive book collection (featuring my story too – a Marooned/Ellie crossover!)! So go read Marooned and support Tom when he gets his campaign going. Ellie will return on August 1st. The weather should be clear by then. Great picture. 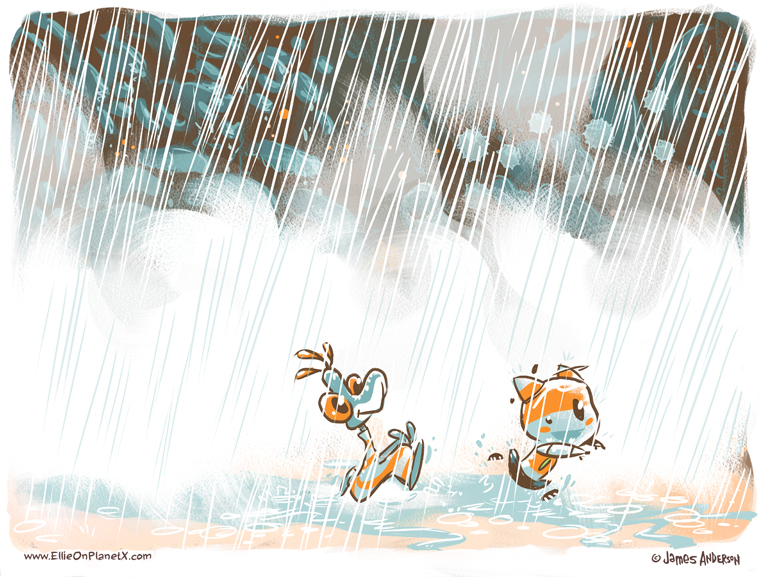 How long in advance did you plot the storyline so the downpour would just HAPPEN to come out when you needed a break? I hope Ellie has sufficient battery-life to last 3 weeks without sunlight. With Ellie having been launched 30 years ago, that would be a heck of a planning in advance!